The Safety Centre are pleased to introduce the addition of a range of cigarette smoke alarm system products to our product portfolio. 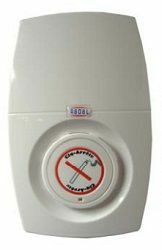 These devices are designed to warn persons to extinguish their cigarettes if they are smoking in areas where smoking is prohibited. For more information on cigarette smoke alarms call us NOW on 01200 428 410 or use our Livechat facility below. The range of alarms manufactured by Radal Technologies are battery powered units which are extremely easy to install. They have integral voice alarm sounders and are available in both optical smoke and flame detector varieties. There is also an infra-red remote controller available for these products which is used to alter settings on the devices. If you’re interested in these products you may also be interested in our Emergency Lighting Batteries and Vesda Aspiration Systems ranges.